By 1980 the Cold War, a grinding state of indirect conflict between a developed, Capitalist “West,” and a developing, Communist “East,” had been going on for over three decades. The Capitalist nations of the North Atlantic Treaty Organization (NATO) were arrayed from North America across Western and Southern Europe to hedge in any encroachment of Soviet Communism further west, and bound by their mutual defense clause to consider an attack on one nation an attack on all. Any such attack was predicted to come from NATO’s nemesis, the Communist nations of the Warsaw Pact, a Soviet-led alliance of Eastern European countries with its own mutual defense clause to prevent any capitalist encroachment further east. Both sides were heavily armed with vast nuclear arsenals capable of ending or seriously complicating all life on Earth, both connected to these mutual defense triggers. Since anybody attacking anything in Europe could easily lead to the mutually assured destruction of Soviet-US nuclear war, the two political bulldozers stared each other down, idling in high gear. Arms reduction talks and other détente policies had calmed the situation some, but as 1980 opened on Europe the Iron Curtain still held firm for both sides in a long-term status quo stalemate. By decade’s end it would be torn down and the Cold War ended. It is indeed ironic that Warsaw Pact, which had been signed in and named for the Polish capital, began to fall apart most dramatically in that same nation. Solidarity, a labor union-turned political player challenged the Communist government starting in 1981 with labor strikes and other such nonviolent means. Throughout the 1980s, Solidarity was suppressed by the hard line Jaruzelsky government, but continued its disciplined nonviolent actions in the underground, pursuing reforms based on Catholic social teaching as opposed to Communist rule. Solidarity leader Lech Walesa, supported by Washington and Rome, campaigns for President of Poland in May 1989. The group had as its rallying figure electrician-turned-dissident Lech Walesa and enjoyed robust supported from the CIA, Reagan’s Washington in general, and the Roman Catholic Church (under its first Polish pope, John Paul II). In 1988 they gathered enough steam to launch a final wave of strikes; the economy ground nearly to a halt, and the government was forced to open negotiations. 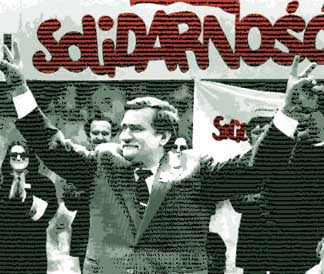 Soon the Solidarity party was allowed to stand candidates in elections, and their leader Walesa was overwhelmingly elected president of Poland at the end of 1989; the Communists were driven out and a new day dawned. Beyond Poland’s borders, Solidarity’s decade-long example had sparked imitators, whose own struggles crested that same year. Czechoslovakia saw Vaclav Havel's “Velvet revolution,” and Hungary and Bulgaria also saw revolutions in late 1989. Romania’s brutal leader Nikolai Ceausescu was given the Mussolini treatment, executed along with his wife on Christmas Day, their corpses shown on worldwide TV. But of course the most vivid and widely remembered story of the year was the opening of the Berlin Wall on November 9 to an exuberantly united Germany (it wasn’t physically torn down for another year). The events of 1989 announced the sudden and final end for the Soviet-led eastern bloc. Spectators in Washington, London, and Brussels watched with a mixture of satisfaction and professed surprise as people power expressed with primarily bloodless uprisings allowed the “democratic West” to finally win the Cold War in Europe as the last decade of the 20th century began. Further east but earlier that same year, another attempted revolution against Communist rule didn’t go so well. Chinese president Deng Xiaoping’s policies of liberal reform went too far by the standards of many citizens, and not far enough in the eyes of others. This fragmented discontent rose above the surface in Beijing, with protest activities beginning in April. By May the activists started a hunger strike centered on Tiananmen Square, and solidarity strikes spread across the country, threatening the economy. Authorities first tried to quell the protests non-violently, but the decision was finally made to concede nothing to the demonstrators, who were seen as tools of external “bourgeois” powers. Martial law was declared on May 20, and the government ordered units of the People’s Liberation Army (PLA) to regain control of the city on June 4. 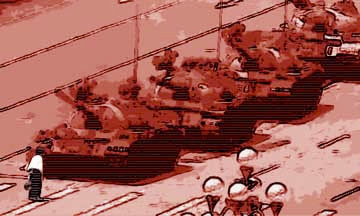 Tanks were sent to crush through roadblocks erected by protesters, and PLA troops reportedly fired directly into the crowds without warning. Casualty estimates vary widely; Chinese authorities cite 400-800 killed, others cite deaths in excess of 2,000, besides perhaps tens of thousands injured and/or imprisoned. This was called the “June 4 incident” in China, and the “Tiananmen Square Massacre” in the west, which imposed various sanctions and other punishments over the episode. Nonetheless, the idea of a dictatorial East won the day in China and the “People’s Republic” carried on much as it had. The lone protester, identity and fate still unknown, who famously but briefly held up a PRC tank column at Tiananmen Square, June 4 1989. The massacre at the “gate of heavenly peace” revealed starkly the dangers of mass opposition as a tool of pressuring or toppling governments. This gloomier side, along with the more positive examples in Europe, sent a mixed message for nonviolent protesters as the 1990s opened. The Warsaw Pact, with its leadership in Moscow teetering, had been broken and Eastern Europe freed. But the PRC had not been on the brink of collapse and so remained intact in all its repressive efficiency. Many lessons can be drawn from this dichotomy, depending on one’s perspective, but clearly Solidarity and Tiananmen presented the twin pillars of civil insurgency – the peaceful and successful vs. the brutally suppressed. At the risk of over-simplification, the events of 1989 presented an East-West polarity that would leave an impression for decades and would evidence itself as the 21st Century's round of transformations played out.